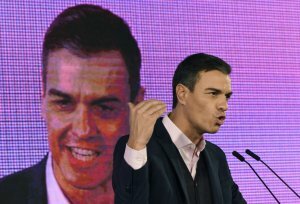 Spain’s Prime Minister Pedro Sánchez has reiterated his threat to vote against the draft deal on Britain’s exit from the European Union at the weekend unless it guarantees Madrid’s veto over Gibraltar’s future status. Britain’s Prime Minister Theresa May is due to sign a treaty with EU leaders to leave the bloc on Sunday, but Spain’s warning over the contested British territory on Spain’s southern tip may add another complication. ‘If this is not resolved by Sunday, Spain unfortunately … will have to vote no, and exercise its veto because this is a question that affects the essence of our country,’ Sánchez told a joint news conference with his Portuguese counterpart Antonio Costa in the central Spanish city of Valladolid. Spain has a long-standing claim on Gibraltar, which was ceded to the British crown in the 1713 Treaty of Utrecht. Madrid wants to retain what it sees as its right to negotiate the future on Gibraltar with Britain on a bilateral basis, giving it an effective veto. Although the legal service of the EU Council has tried to reassure Spain that the text does not preclude this, Madrid is upset that the draft Brexit deal does not clearly spell out that it will have a veto over the tiny territory’s future status. Before the start of Brexit negotiations in June 2017, the EU assured that no agreement between the bloc and Britain would apply to Gibraltar without Spain’s approval. Spain’s Foreign Minister Josep Borrell had already warned on Monday, after a meeting of EU ministers, that the draft deal does not spell out how Gibraltar should be handled. ‘Until it is clear … we will not be able to give our agreement,’ he said. His government has adopted a tough stance on Gibraltar just as the southern region of Andalusia, a Socialist bastion which surrounds the British territory, is gearing up for a regional election next month. ‘Sánchez is under pressure at home from the right ahead of elections in Andalusia on 2 December and is making a big play on this for domestic consumption,’ said Mujtaba Rahman, managing director for Europe at research firm Eurasia Group in London. ‘We don’t see it as a deal-breaker, but this issue is the one which could potentially flare up on Sunday night,’ he added. Separately, Madrid and London reached four agreements governing the relationship between Spain and Gibraltar after Brexit covering tobacco smuggling, police cooperation, the rights of cross-border workers, the environment and one tax agreement, the Spanish government said Wednesday.